100% solids formulation is low odor and solvent free. 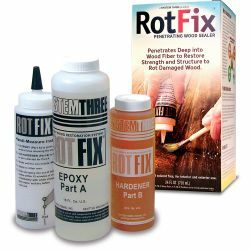 Flows like water for superior penetration into wood and most porous materials. Two part system features an easy 2:1 mixing ratio. Apply by pouring or brush. Reliably cures at temperatures as low as 35°F. Can be used on damp wood. Use to harden soft, "punky”, wood as a base for further repair. Seals wood permanently to prevent future moisture penetration.